Parades. A beloved pastime celebrated all over the world. Who wouldn’t want to be part of one? For many marching bands, parades represent achievement; for others, they are a stepping stone to the next big thing; and others just find them fun. Just as each band is different, so is every parade, and there are hundreds all over the country—and the world—from which to choose. 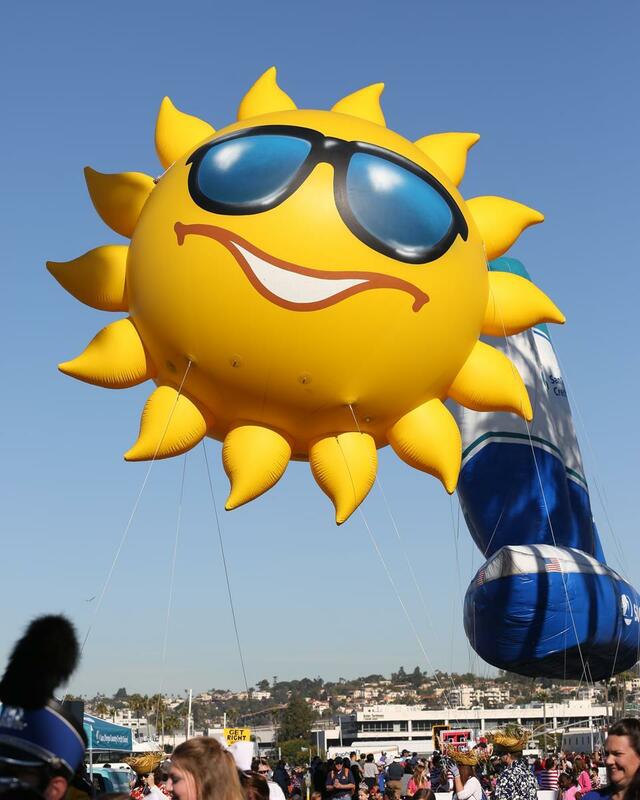 Big Bay Balloon Parade, San Diego. 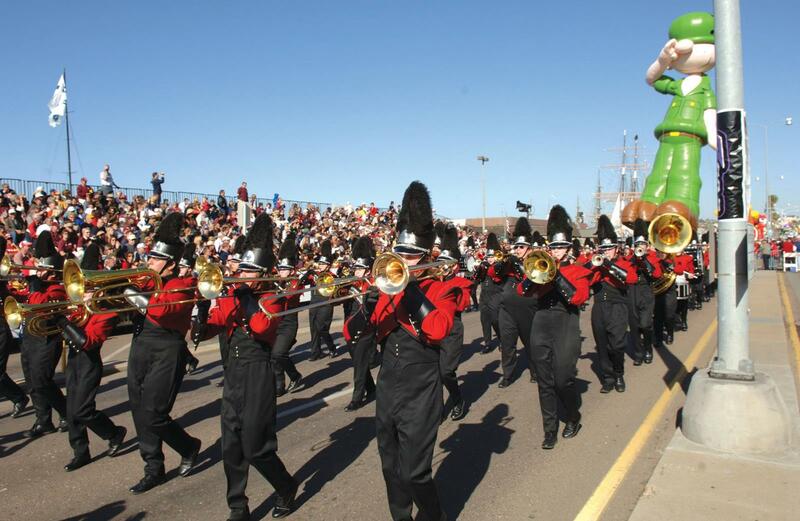 A National University Holiday Bowl production, this wintertime parade brings together first-rate marching bands, impressive floats and enormous balloons. Hollywood Christmas Parade, Los Angeles. A long-standing holiday tradition, this parade has been held for over 80 years and runs through the heart of Hollywood. Carnaval San Francisco, San Francisco. Cultures and traditions come together in this beloved event that features a grand parade, hundreds of performance groups and a diverse selection of bands. Starting in 1891 as a one-parade event, Fiesta San Antonio has grown into a premier festival and now features three parades. New York City Veterans Day Parade. A popular and meaningful parade that marches along Fifth Avenue past famous landmarks and is cheered on by enthusiastic crowds. South Boston St. Patrick’s Day Parade, Boston. One of the largest St. Patrick’s Day parades in the country, this event dates back centuries and is a time-honored tradition any band would be lucky to march in. Thanksgiving Parade of Bands at Walt Disney World Resort, Orlando. A prestigious event dedicated exclusively to marching bands, this event features performance groups from all over the country, as well as special guests the Boston Brass. Citrus Parade, Orlando. One of the largest sports-affiliated parades in the country, the Citrus Parade features floats made of fruit and high-spirited bands from all over the nation. Outback Bowl New Year’s Eve Parade, Ybor City/Tampa. A festive evening party in eclectic Ybor City, with floats, bands and non-stop fun to welcome in the New Year. Chick-fil-A Peach Bowl, Atlanta. Another New Year’s Eve parade, this Georgia event serves as the kickoff for game day with colorful themed floats, classic cars, marching bands and dynamic dancers. Dogwood Festival Parade, Winchester, Tennessee. This parade is part of a highly anticipated annual event, drawing nearly 30,000 people every year. IPL 500 Festival Parade, Indianapolis. Held the evening before late May’s Indianapolis 500, the parade draws 300,000 spectators from across the country to watch larger-than-life floats, costumed characters and dozens of marching bands. The Magnificent Mile Lights Festival, Chicago. This parade is the nation’s largest evening holiday celebration, with a procession that lights up Michigan Avenue as it goes by. Republic Bank Pegasus Parade, Louisville. The oldest event in the Kentucky Derby Festival, this parade marches down Broadway showcasing some of the finest equestrian units and bands in the country. Valley of Flowers Parade, Florissant, Missouri. The First Festival of Spring has been held for over 50 years and includes a beloved parade that highlights the weekend event. Cherry Blossom Parade, Washington, D.C. A treasured springtime celebration with lavish floats, giant helium balloons, family entertainment, and, of course, marching bands. Philadelphia Thanksgiving Day Parade. This 1.4-mile procession is the oldest Thanksgiving Day parade in the country, making its way through the streets of Philly for thousands to enjoy. Parade of Nations, Norfolk. A salute to NATO nations, this parade has been attracting marching bands from all over the U.S. since 1952.